Ask for help - SouthAfrica.TO travel agents are itching to show you the best flight deal. 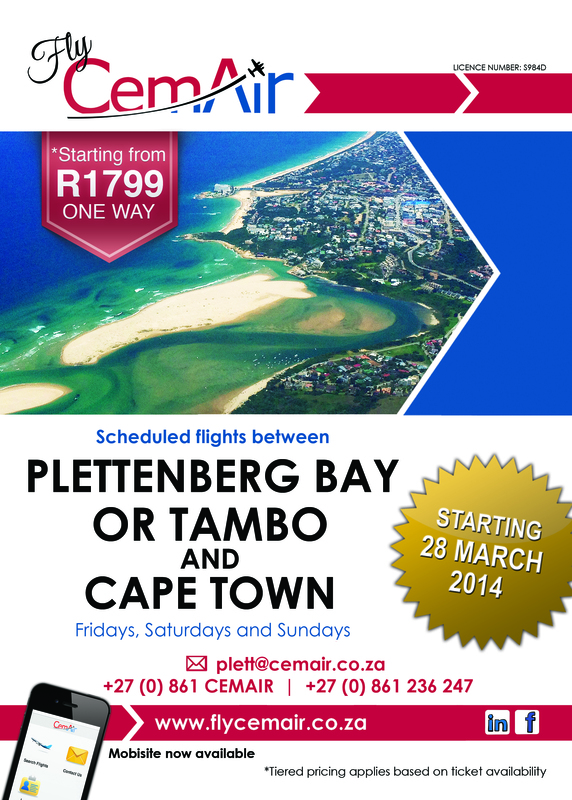 None of the major airlines operate regular flights from Johannesburg to Plettenberg Bay (JNB - PBZ), but Fly Cemair are kicking off the route on the 28th March 2014. 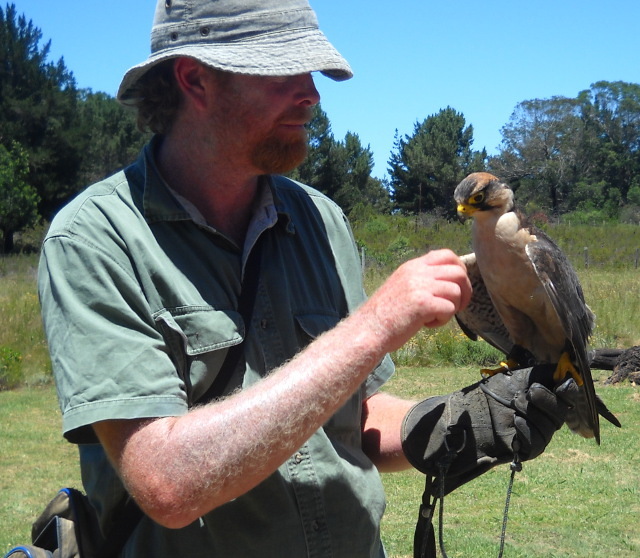 On Fridays & Sundays, FlyCemair leaves JNB at 09h00, and arrives in Plett at 11h30. It then departs Plett at 12h00 and arrives in Cape Town at 13h15. It then leaves Cape Town at 14h00 and arrive in Plett at 15h15. It then leaves Plett at 16h00 and arrives in JNB at 18h30. On Saturday it is scheduled to leave OR Tambo at 09h00 and arrive in Plett at 11h30. It then is scheduled to leave Plett at 12h00 and arrive at OR Tambo at 14h30. 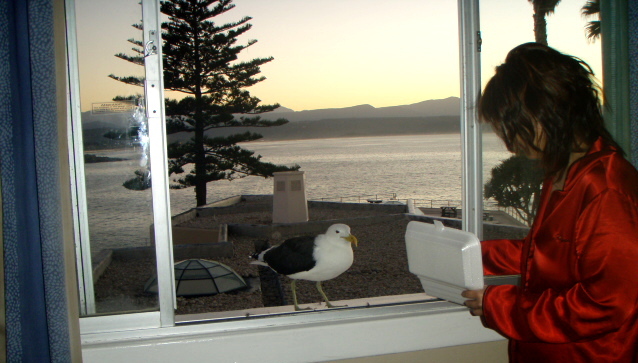 "My recent experience on my trip to Plettenburg Bay was hectic. A pregnant woman on board had her baby delivered in mid air with the aid of the air hostesses - they were excellent. The mother was so stressed that there would be a problem, but the joy and relief on her face when she saw her new born son was unforgettable! "I've played drums in many bands in Cape Town. I was once playing drums in a band, a few years ago, which decided to travel through to the Grahamstown festival, to soak up the culture and develop our business approach, using a "hands on" basis. When we arrived at Plettenberg Bay, en route, we popped in at a club nearby and soon found that the vibe was actually a lot hotter than Cape Town's, where I'm from. The people were very responsive to the band performing, which included a drummer using an electronic drum set, and parts which were obviously programed in advance. The result was something that the audience craved, seemingly. It was a brilliant experience in that one of the bars which we we went to, had a one man band performing, and naturally, being a guitarist as well, I wanted to see what I would sound like with a full PA and holistic setup. Ironically, despite my previous success, in being allowed to play at bars, on that night, the guitarist at the particular venue, said that he can't allow me to play because of his contractual obligations...I felt a little odd because I completely understood what he meant, but I was hoping to get a shot at it. I resorted to playing video games at a local play centre, checking out the beautiful scenery and being more social. Even though I always had that gig in the back of my mind... A few years later, I was playing guitar in a band of my own, as lead player. Not many asked me if they could 'jam in' at our events, but when they did, I always felt a certain sense of obligation, to allow anyone to give it a shot. The result was a series of really great gigs, with people jamming guitar once in a while, and showing their talent, straight off the bat, with little to mar their delivery, in front of larger crowds. I didn't really mind. It seemed that the guitarist, whom I've mentioned, didn't either, but our band approached the gigging routine differently to others, and we made sure that we had enough say in such things. Eventually, I wound up playing all over the country and met Barney Simon, and many other luminaries, along the way. Plet has always been a place of deep holiday attraction, since then. Even though I didn't get to play... I had so much fun, just not working, that I'd love to go back as a fully fledged tourist, instead of as a working musician, whom has to navigate the terrain, from a performance point of view." James Reynard. "My grandson and I flew down to Plettenbergbay to visit my cousin for a week and then my husband joined us a week later, to celebrate our 30th wedding anniversary there. It was my grandson's first real beach holiday...he had so much fun...we spent time on the beach, visited Monkeyland, Jukani and the Knysna Elephant Sanctuary...he keeps on asking when are we going again....we called the holiday "Heeltyd Speeltyd 2014" it must have been the greatest fun that we have had in 30 years of being married. 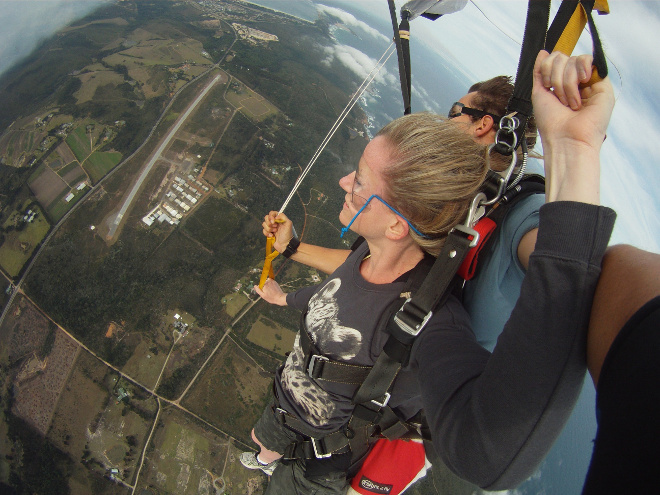 Apart from it being great to spend time with family - the weather was great and Plett is definitely a JEWELL that has crept into our hearts...I doubt whether we will ever go anywhere else for a holiday again." Anndor Steenberg. "My name is Thabang Mdlalose I have never been to Plettenberg bay but from what I have heard it’s a nice place to visit as its an absolutely fabulous experience where you feel at one with nature. I also hear that Plettenberg bay has a nice sight seeing for Animal Park of big cats, Adventure Land - Water Slides and Play Park, St Peters Anglican Church, Van Plettenberg Beacon, Robberg nature reserve and lovely exclusive hotels. I personally find all the items mentioned very attractive and exciting." On the 30th January 2014, Fly Cemair sent out an email asking recipients to take part in an online survey about whether they'd like a scheduled flight service from OR Tambo to Plett. In the survey they ask participants what day of the week they'd like to fly, what time, what would they be willing to pay.